Snipe nose plier with insulated handles and slim, semi-circular shaped and serrated jaws. Accurately machined jaws provide a sure grip on the workpiece. Tips give good grip and improved accessibility in confined spaces. 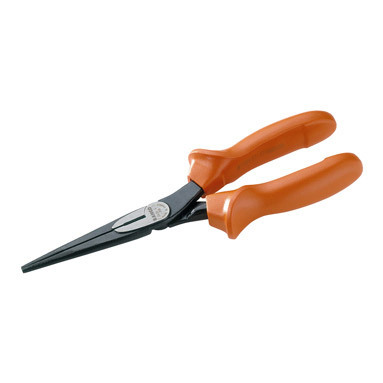 Sharp edges for cutting softer material such as copper wire and plastic insulated wire. Handles insulated up to 1000 volts. Cutting capacity: Hard steel wire. Conforming to CEI/IEC 900, EN 60900.